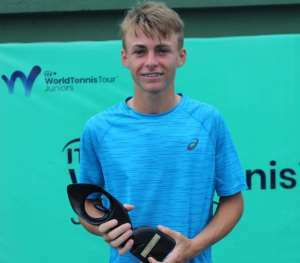 Winning two titles on the ITF World Junior Circuit (Accra J5 ITF 7&8) in two weeks is no mean feat, and French teenager, Bondaz is a very happy boy. He won 6-3, 6-2 against Eshaan Lumba from India in the second week at the Accra J5 ITF 8 competition which was sponsored by McDan Shipping Company Ltd.
Chelsea Fontenel from Switzerland and Chyara Onia Seke from Belgium won the girls doubles while Vence N’ Tcha from Benin paired with Ronan Sahni from Great Britain to win the boys doubles title. The competition moves into the third and final lap at the Accra Sports Stadium this week. Dr. Dan Mckorley, Director of McDan Group said Ghana Tennis is rising and now in the good books of the ITTF. He said his company will take Tennis to a high level and very soon lovers of the game will troop to the Accra Sports Stadium to watch good Tennis. He encouraged other companies to support Tennis since it is a great sport for kids, the youth and adults. He advised Ghanaian youth to play Tennis because it is good health wise and very rewarding as there is prize money to be won at tournaments.